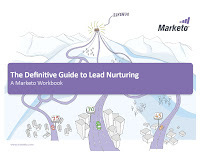 Marketing automation provider Marketo has just published The Definitive Guide to Lead Nurturing, a white paper that provides real value, covering the lead nurturing process from the basic how and why through ROI measurement. Unlike most white papers, this guide is very light on marketing (selected pages have sidebars headed “How Marketo Does It” rather than embedding marketing copy in the content—a nice touch). Also, it’s available in full immediately for those willing to provide their basic contact information, or as a series of chapters to be distributed throughout the month of August for those who prefer to obtain the guide anonymously. “Only in the last third of the today’s purchasing process do buyers want to engage with sales reps. This changes the role of marketing; instead of generating the lead and moving on, today’s marketers must synchronize their marketing throughout the buying process, providing potential buyers with high quality content that is contextually relevant.” (Scott Albro). Research from other sources shows companies that excel at lead nurturing generate more qualified leads at a lower cost per lead, reduce the percentage of marketing-generated leads that are ignored by sales, increase win rates, and have a higher percentage of sales reps who make quota. Content marketing plays a key role in lead nurturing as well as a successful lead generation and social media strategy. As the report notes, “The most important brand attributes for a B2B vendor are often credibility and trust – and unless you are a well known company like IBM, the best way to build credibility and trust is by sharing useful information. If you can help frame the discussion, your company will be seen as a trusted advisor and thought leader. If buyers believe that your company understands their problems and knows how to solve them, this helps reduce the feelings of fear and can make a big difference in being selected for consideration and purchase.” It also sets you apart and builds credibility on the front-end of the buying cycle, making efforts from SEO to banner advertising and AdWords more effective and productive. The report provides helpful guidance on lead nurturing basics, lead scoring, the different types of opt-in (and when each is most appropriate), and advanced lead nurturing tactics such as accelerator campaigns (“campaigns that attempt to move prospects along the buying cycle faster by providing relevant `nudges’ at the right time, usually triggered by specific buyer behaviors or sales updates”). It closes with a section on the ROI of lead nurturing, complete with worksheets for performing your own lead gen activity return calculations. Again, Marketo’s lead gen guide will be made available in chapters throughout this month for anonymous download, or you can grab the complete Definitive Guide to Lead Nurturing today. Note: this post was originally published on the WebMarketCentral blog in August 2009. 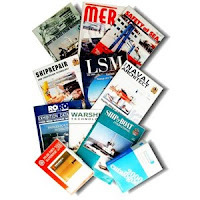 Will Content Marketing Kill Trade Magazines? This post was originally published on the WebMarketCentral blog in November 2009. Content marketing is all the rage. Check out Joe Pulizzi’s Junta42 blog, pick up a copy of Ardath Albee’s wonderful new book eMarketing Strategies for the Complex Sale (which builds upon the foundation laid by David Meerman Scott and others), follow @Mike_Stelzner on Twitter—it’s everywhere. Marketers are becoming publishers, writing valuable thought leadership and how-to content in order to build name recognition, credibility, and even sales pipelines. Back in the pre-Internet days, trade publications were pretty much the only way to efficiently reach narrowly targeted niche audiences, like architects, chemical engineers or IT help desk managers. Even in the early days of online, trade publication websites and their newsletters were essential media. But there’s no question that journalism is taking a beating during this downturn. Across all media, more than 35,000 jobs have been lost in the past year. While a large share of those positions have been shed in broadcast and newspapers, trade publications haven’t been immune. The challenges faced by trade publications go far beyond the current economic slowdown. Trade pubs traditionally flourished due to five conditions which simply no longer exist. Audience. As noted above, trade publications were once the only way to reach niche audiences. Today, there are far more options: specific segments can be reached through SEO, SEM, industry-specific blogs, LinkedIn groups, Twitter and other venues. Certainly, trade publications still have value in delivering targeted audiences, but they no longer have a monopoly. Authority and independence. Content produced by marketers and PR professionals is always, of course, self-serving: that’s their job. Content produced by trade publications, in contrast, has been seen as less biased and more independent. But the fact is that no type of media has ever been truly objective, and it may not even be possible. With the dramatic increase in content enabled by online publishing, this has become ever more apparent, and cynicism has grown. People now understand that CNN doesn’t provide the “news,” it serves up the liberal take on it—as Fox serves the other end of the political spectrum. And the reporting in trade publications, despite assertions of a “Chinese wall” between editorial and ad sales, has always been influenced by advertiser spending. In the late 1990s, when big companies were taking huge write-offs and even declaring bankruptcy due to failed implementations of large ERP systems, ComputerWorld stood out with its honest reporting; most other publications continued to push bubbles-and-sunshine pieces about these systems and vendors. Expertise. The editors and reporters at trade publications were once looked to as experts in their specific fields, and in many cases they were (and still are). But many of the writers were just that—writers. They may reported for Golf Digest one day and a niche publication focused on mechanical engineering the next. How did they get their material? By interviewing experts on both vendor and user sides. Today, those vendors and users can publish their own content in blogs, article publication sites and elsewhere, without the need for a middleman. Advertising. Designing clever ads and placing them with targeted publications used to be a primary method for brand building and direct response. But as books like those from Ardath Albee and David Meerman Scott noted above contend, with individuals now exposed to 4,000-5,000 advertising impressions of some sort on a daily basis, advertising in general has become less effective. People use technologies like iPods, TiVo and even online ad blockers to avoid additional advertising exposure. Marketers today are relying more on producing thought-leadership content to attract prospects than on traditional in-your-face advertising, according to a recent study reported by HubSpot. As the report also notes, advertising still has its place, it just doesn’t have the same priority, or share of budget, that it once did. Aggregation. Trade publications used to serve the role of content aggregator, bring together the best content from experts on both the vendor and user sides as well as leading industry analysts. While they still provide that service to some extent, trade pubs are no longer the only game in town. Content producers now have many more options, including their own company websites, product or service microsites, blogs, article sites like Ezine Articles, Hub Pages and Google Knol, and other venues. For example, this article on H1N1 and pandemic planning was self-published on a company site, drawing traffic through SEO and social media. And other sites, such as the B2B Marketing Zone, aggregate blog posts on specific topics (b2b marketing in this case). Perhaps “kill” is too strong a word, but the changing content landscape and plethora of publishing options certainly present significant challenges for trade publications and are forcing changes to their business model. What do you think? Many social media experts believe a blog should be the core of a social media strategy, as the key vehicle for sharing thought leadership content which can then be promoted using Twitter, social networking and other tools. No question, there are many compelling reasons why blogs are important for business. But what if you simply don’t have the time or resources to commit to maintaining a blog with regular posts, or at least you’re not ready to make the commitment yet? Here are six other ways to share your thought leadership content without committing to the demands of regular blog posting. Create an area for articles on your website. This allows you to write and post articles as time permits, rather than committing to a regular once, twice or more per week posting schedule. This also allows you to write fewer but more in-depth articles less suited to the blogging format. You can still promote this articles using social media and SEO just as you would with blog posts, and even add an RSS feed (yes, it’s possible to add an RSS feed to any web page, though it is likely to attract fewer readers than regular blog posting). Many online trade publications will accept (and are actually hungry for) bylined articles, as long as they are true thought leadership pieces that address industry issues rather than blatant product or service promotion. Most will permit one or more links back to your site as part of the “about the author” section, which is helpful for both direct traffic and SEO. For a little more creative freedom (including the ability to add text links within the article to specific pages on your site), try publishing an article through article publication sites. Many of these articles appear well in search on their own (particularly EzineArticles) as well as being great sources of links for SEO. If you have an article that’s most suitable as a blog post, try contacting influential bloggers in your industry about providing a guest post for their blog. Again, as long as the post is suitable for their readers and focused on thought leadership rather than promotion, many bloggers will appreciate getting a “day off” from writing their own content, and will permit a link or two back to your site, at least in the “about the author” section and possibly within the content as well. Be sure to link to other authoritative sources within your copy as well to maximize value to the readers as well as appearing truly helpful, not just self serving. Google Knol unfortunately uses the insidious no-follow tag, so you won’t get any SEO benefit from posting there, but the articles themselves often show up well in search. So, you can still include links to your site from your article; while these won’t supply any SEO link juice, they often provide relevant direct traffic. Many industry-focused and general web directory sites, such as Qondio, allow you to post articles as well as standard directory listings. Requirements tend to be similar to those for article publication sites. These are sort of the reverse of Google Knol; while articles on these sites may not show up highly in search listings themselves, they do pass link juice and so are helpful for the SEO on your own website. A regularly updated and properly promoted blog is still the best way to socially share thought leadership content. But if you’ve got some content, but not enough for regular blog posting, these alternative avenues can still be helpful and supportive for content marketing, social media and SEO objectives. What does 2010 hold for content marketing? ClickPredictions: Key Content Marketing Trends and Predictions for 2010, an intriguing ebook just released by Marketo and ClickDocuments, attempts to provide some answers. To compile the ebook, the sponsors asked 38 of the world’s top b2b marketers (and me) to offer insights on key marketing trends and predictions for the coming year. Content marketing is, in many ways, the new advertising. Prospects, particularly for complex b2b products, don’t care about marketing copy, they care about solving their problems. A carefully crafted content marketing strategy begins with positioning your company as the helpful and knowledgeable experts in your industry, and flows through content that illustrates why your product or service is uniquely the best choice to fix a critical issue for a particular type of company. The ClickPredictions ebook includes prescient commentary from an impressive array of experts, including Mike Stelzner, Rebel Brown, Ian Lurie, Patsi Krakoff, Michele Linn, Steve Woods, Galen De Young, Jon Miller, Stephanie Tilton and more. Each author also provides a list of their favorite resources for further reading. If your company is using content to attract prospects and help guide them through the buying process to ultimately select your offering, check out what these very smart b2b marketing pros view as the Key Content Marketing Trends and Predictions for 2010.